For the last several months, I’ve been running ThinkResults Marketing through our own full relaunch process and it’s been a humbling experience. When we’re working with clients through a launch process, we are fully prepared for emotional reactions, for them to take longer to move through the plan than they expect, and for there to be roadblocks and diversions distracting them from this critical task. Everyone on the ThinkResults team is very adept at accommodating our clients and coaching them through this difficult birthing process we call “launch and repositioning”. I just figured since we were all such pros at this, with a rich intellectual understanding of what needs to happen and what the normal reactions are, that the process would be easy for us. Simply put, I was cocky. 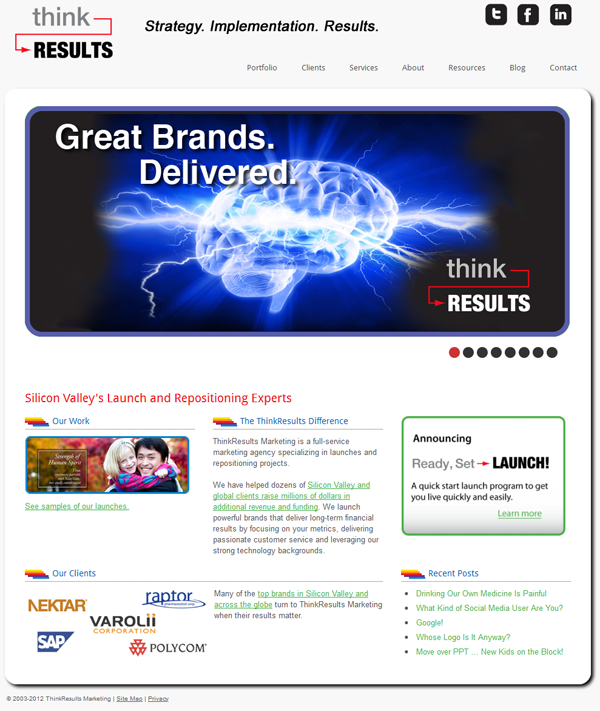 I was wholly unprepared for my own reactions to the launch process as the founder of ThinkResults Marketing. Having now been through this with our crackerjack launch team, I truly understand what it means to be a founder and go through a launch (or this case a repositioning). What it means to have someone on your team tell you what THEY think the brand (i.e., your baby) means. To have heated, passionate arguments about what we stand for. To have terse discussions about what kinds of clients we are meant to serve, and which kinds we are not (hint: non-payers top the pile!). To get totally conflicting opinions about logo design and direction. Wow. I cannot express how weird it was to be drinking our own medicine. I can say, though, that I am incredibly, unbelievably proud of the depth of critical thinking that we poured into this repositioning. Of the attention to detail that we are famous for. Of the creative ideas that were sparked as the team worked alongside each other, each bringing their own unique expertise to complete the overall puzzle. I am also pleased at how it all turned out and am clear that I could never have done it on my own. This new site and the entire repositioning process has finally fleshed out a vision I created over nine years ago. We have the good fortune of having truly inspiring clients and I wanted the site to really show off their results and their stories. Because we believe that there is no success for us unless our clients achieve the results they wanted. We wanted a brand that showed off our expanded capabilities and showcased the cool stuff our clients are doing. I think this site achieved that objective. The ThinkResults team totally rocks. Thank you for making this happen. Let us know what you think of our new brand. We promise we won’t be crushed if you have criticisms!